A "Manouché" (plural: manaïches) is a traditional Lebanese bread that one eats for breakfast or as snack during the day. 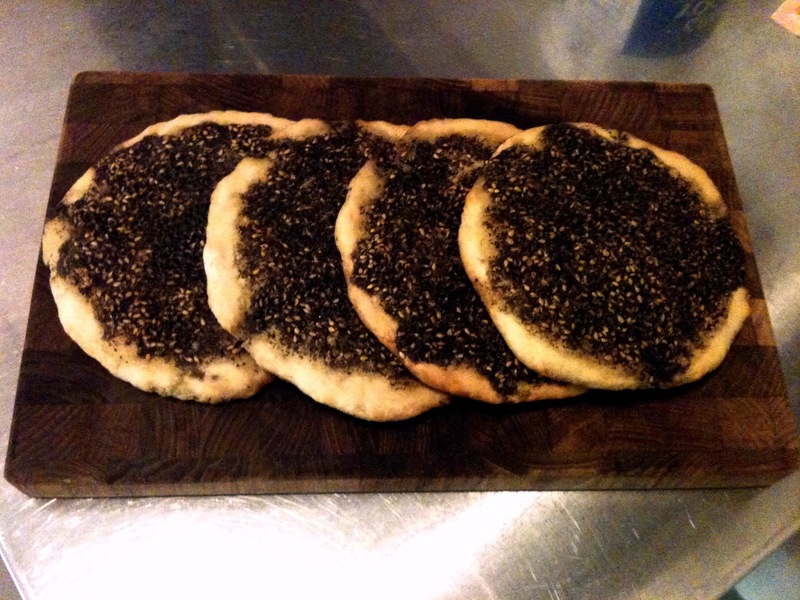 It is a flat round bread (similar to a small pizza) covered with a mix composed of olive oil and zaatar. Zaatar is a symbolic spice from the Middle-East and it often called "thyme of Aleppo". This herb is usually mixed with sumac, sesame seeds and salt (and some other herbs depending on the region) to make up what is commonly called zaatar (as opposed to the spice alone). I only got the opportunity to eat manouché a few times in Lebanon but I remembered that I liked it a lot and my father often tried to replicate it when I was a child. Since I received some zaatar from Lebanon this week I decided to try it myself and bake them from scratch. Manaïches are easy to make and take about 1 hr to prepare. The first trial was ok but the dough was a bit too thick and dry, so for the second round I decided to make the breads a bit flatter (o.5 cm thick, then they rise) and to add more of the zaatar mix and to let it soak on the dough at least 10 min. And the manaïches came out great! They were delicious, crispy outside and soft inside! But it's important to eat them warm, because if they get cold and then you try re-heating them they become chewy. Mix both ingredients in a bowl and let sit while preparing the dough. In a bowl wet the yeast with the water. Add flour, olive oil, sugar, and salt, mix well. Work the dough until it detaches from the bowl walls and divide it up in 8 parts. Let the doughs rise for at least 30 min. Flatten the doughs into circular disks and put them on an oven plate with parchment paper. Put 2 tbsp of the zaatar mix on each dough and spread it. Let it sit for 10 min (so that the dough gets soaked with olive oil). Then add a bit more zaatar on each dough and bake in the oven 10-12 min at 210C. Serve the manouché right away and enjoy it warm!